LOS ANGELES (AP) — Southern California firefighters contained part of the fourth-largest fire in the state’s history but warned coastal communities Wednesday that they’re still at risk if unpredictable winds whip up again and fan the flames. The National Weather Service extended warnings through Friday of extreme fire danger conditions throughout much of Southern California due to lack of moisture along with a possible increase in wind gust speeds at the end of the week. Firefighters made some progress Wednesday on corralling the so-called Thomas Fire, which has spread into national forest land northwest of Los Angeles. However, they warned that the fire would continue to spread west as it eats up parched brush. By Wednesday evening, state fire officials said the blaze was 30 percent contained but it continued to threaten Santa Barbara, Carpinteria, Summerland and Montecito — a wealthy area home to celebrities such as Oprah Winfrey. Since the blaze broke out on Dec. 4, it has burned more than 372 square miles (965 square kilometers) and destroyed 921 buildings — including at least 700 homes. It threatens 18,000 buildings and has prompted evacuations of about 100,000 people. 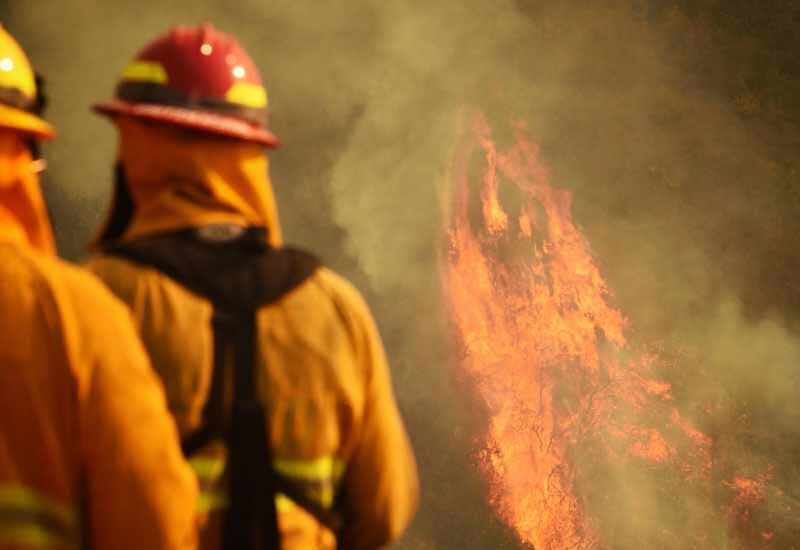 Elsewhere, fire officials announced that a cooking fire at a homeless encampment sparked a blaze last week that destroyed six homes in the exclusive Bel Air neighborhood of Los Angeles. The Fire Department was working on a plan to locate such encampments at the start of fire season next year to avoid danger, Scott said. At the largest of the fires northwest of Los Angeles, firefighters protected foothill homes while the flames churned mostly into unoccupied forest land, Santa Barbara County Fire Department spokesman Mike Eliason said. Rock and Roll Hall of Fame member Eric Burdon and his wife, Marianna were among the people who fled the smoke in the small city of Ojai Tuesday. Burdon, a member of the 1960s British Invasion band The Animals, wrote on Facebook last week about having to flee and returning temporarily to find his home still standing with ashes all around it.